In August 2010 I felt comfortable in my new career, but needed something physical. It was my first time trying out adulthood and thought I’d like to maybe be a runner. That seemed adult. So I tried that. Running blows. (Although you should totally read this blog, which is about running, but not at all painful) I’d heard about Maine Roller Derby — a 2-hour drive away — and thought that would be a good fitness goal. Obviously, I wouldn’t join that league because four hours of driving a night is unreasonable, but I thought making the team would be a fun goal. And boy am I goal-oriented. -I bought $49 skates* and the cheapest pads I could. -I found a community center that would let me skate for an hour on Sunday mornings so I could try skating in circles, not on tar. Did I say you should roller skate? You should really roller skate. One thing I don’t think beginners understand is that the more time you put on your skates, the more comfortable you look. The more balanced you get. The more confident. Faster. You begin to feel your edges (it’s OK. You don’t have to know what that means). Your crossovers get less awkward. You learn that falling is OK. If I were your coach, I would probably want you just to skate in circles (both directions) for the first month. You’d hate me. And then you’d be good at roller skating and have some confidence and be so ready to add on skills. Many leagues have pre-tryout bootcamps, which will be of great help. They can help you work on your fledgling skills. If you’re in a city, there might be Derby Lite or Derby 101, which will get you some derby experience before you commit. If you know a derby skater, maybe just ask her to go to the rink with you some open-skate night. She will have pointers**. Ideally you’ll watch the league you’re trying out for. In person. Before the tryout. But if you can’t, at least visit http://www.wftda.tv and click “archives” and pick the video with the funnest name. Don’t expect to understand it all. It’s sort of complicated. But just watch it and listen to the announcers. You’ll learn something and that will help. Becoming a roller derby fan makes you a much smarter derby skater. Go to the league’s website and learn all you can about the tryout and what you will be asked to do. Email the tryout coordinator to get this information (if possible) before the tryout if you can’t find it. Don’t be pushy or annoying. These people are volunteers. I recommend going into the tryout with a goal that isn’t “make the team.” I also suggest it not be, “don’t fall.” Pick a goal that’s positive, so instead of “don’t cry” make the goal be “have fun, smile at least twice.” If you’re going to go far in roller derby, you’re going to have to learn how to celebrate small victories. It’s all we get. So if you have a great T-stop, get excited about it. If a coach offers you a tip at the tryout, take it. Try it. Try new things. Look at how veteran skaters perform a skill. Question them if you can about their style. Know you can have your own style — but that if they have been skating a while, there might be a reason they skate the way they do. You do not have to eat four lunches on the day of your tryout. Get some carbs, get some protein. Try to eat 2-3 hours before your tryout and not much after that. By hydrated. A suggested day-of menu might be: eggs and toast with a fruit for breakfast, a sandwich at lunch, a burrito for dinner (so long as it won’t upset you). With lots of water. Be nice to the refs. Be nice to the veteran skaters. Be nice to the other people trying out (they might be your teammates soon). Be nice to the people who own/run the roller rink. Be nice to any coaches. Most importantly, be nice to yourself. You’re learning a new thing that is hard. It’s OK to not be great at it. Just accept that both in practice and at the tryout, you will fall. Everyone falls. It’s OK. Just don’t make a big deal about it. Get up so fast. Everyone falls — not everyone can get up quickly and with a smile. Be that person. Skaters love that person. Some fresh meat are picked because they’re ripe. Some fresh meat are picked because the veteran skaters look at that skater who is smiling, joking, having fun, loving life and roller skating, getting up fast when she falls down and they think, “Oh man. I want her on my team.” Regardless of skill. I was the head of tryouts and fresh meat training for my last league. Trust me. For every nine skaters I wanted on my team because of skill there was one I wanted only because of her attitude. If others go out after the tryout, go with them and grab a cherry Coke. Derby is about making friends and laughing about the “mistakes” you made. Last weekend* I helped coach Derby Daze, a weekend of roller derby workshops put on by the Rose City Rollers’ travel team. Shevawn and I led strategy hour. Photo by Frac. It gave me a lot of perspective. Aside from a lunchtime strategy lecture** I was lucky enough to float to other skaters’ clinics and help newer skaters master the skills, one-on-one. Interacting with newer skaters reminds me why I skate derby. And how far I’ve come. That’s one thing I don’t think new skaters understand: When a veteran skater smiles at you — or can’t help but laugh a bit — they’re (probably) not laughing at you; they’re laughing at a previous version of themselves that they see in you. On the first day of the workshops, I asked a skater in our rec league, “what’s been the best part about Derby Daze so far?” She said, “I’ll tell you tomorrow.” I didn’t meet with her again because she was in the advanced class and I tried to stay in the beginner and intermediate-level workshops, so I could be of the most help. 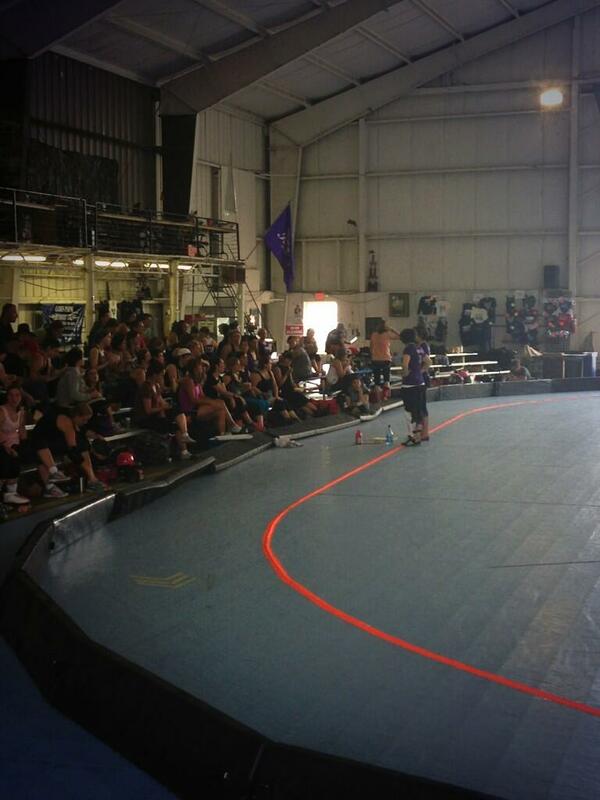 To close the weekend, travel team members scrimmaged with all the skaters. As a special prize, a line-up of black-shirted advanced-level skaters got to scrimmage a white-shirted travel team line up for one jam. My line was Havana Good Time, Belle Starr and Skeeve Holt and they handed me the jammer cap. In that quiet moment before the jam whistle, my opposing jammer tapped my shoulder. 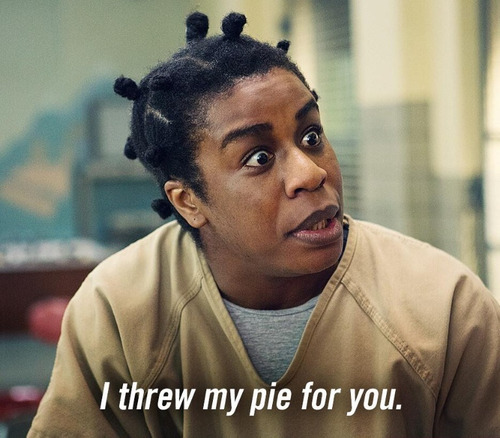 **and by lecture I mean theatrical performance/sideshow/comedy schtick. ***Way to melt my heart, wrecker. Jerk. (wipes tear) I love your heart, jerk. You probably thought it was a big deal wearing a star next to me because my star was purple, but you were the most inspiring skater. 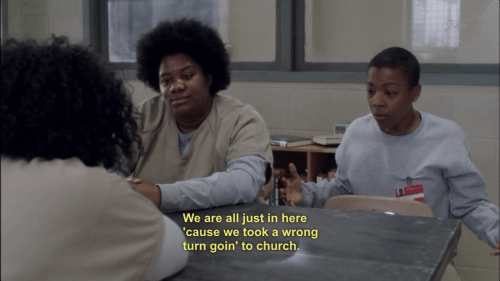 Feel free to add how else roller derby is like the amazing Netflix series Orange is the New Black in the comments at the end of this post. And after a while things get easier. You move up in the ranks. Maybe one day you can run the kitchen. I mean jam. Sometimes, on a weekday in-season, a roller derby skater gets time to see her family or friends. 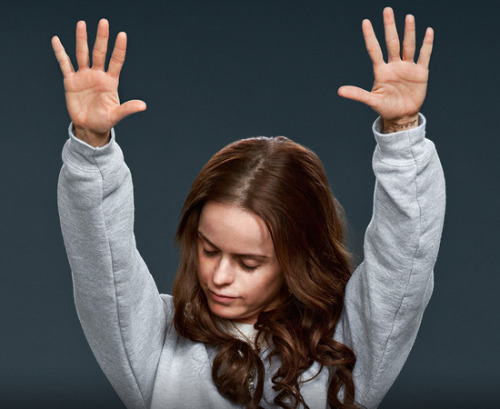 It’s a special, rare moment where the inmate/skater can ground herself in her support system. If only for an hour or two. *This is the truth disclaimer. I was the statewide prison reporter for my last newspaper. Roller derby is exactly nothing like real prison. But this TV show is fun and roller derby is fun and I’m fun, so here you go. **But they’re worn by good-looking women, so there’s that. 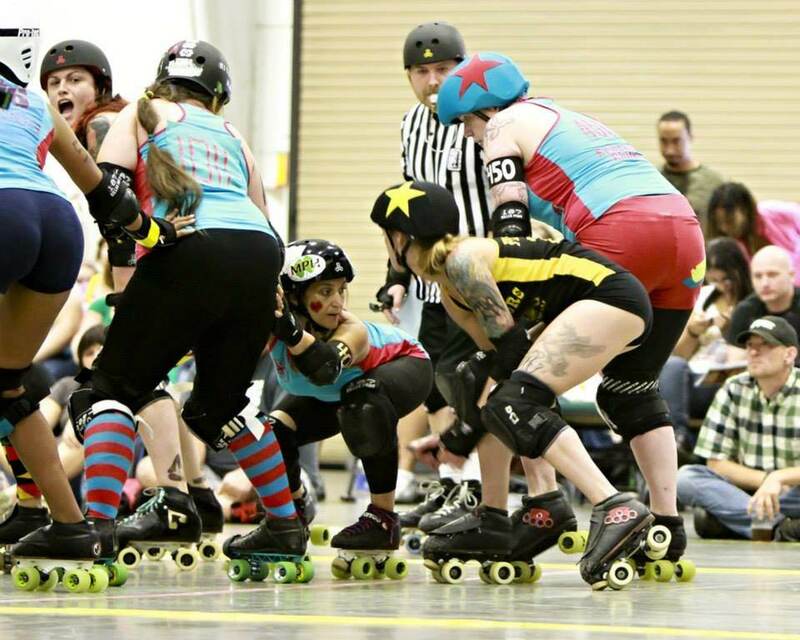 This week roller derby got fair news coverage. That, my friends, should, in and of itself, not be news. But it is. And it’s great news. Here’s the story, written by James Dator for SB Nation and picked up by the Philadelphia inquirer. I talked with Dator about his coverage of roller derby. As a journalist myself, what was the most interesting was how he threw out objectivity. And how doing so allowed him to tell a truer story. The result has been a lot of Facebook shares, clicks and chatter in the derby community. So I had to see what the North Carolina league he covered thought too. Greensboro Roller Derby photo by Frayed Edge Concepts LLC. In a previous post on The Dashboard, I wrote about how journalists always miss the real derby story. I focused on money, but in a later post clarified that that post went viral because we’re sick of cliche “isn’t this quirky!” coverage and because we know this is a huge global movement. I also talked with the league he covered about their side of things. Here it is (Read Dator’s story first). So, on The Dashboard today are two consecutive interviews, first with the writer, then with a skater from the league. Were you familiar with derby before reporting this story? Not outside of the stereotypical view. I, like many still had this perception of the neon-clad, 80’s WWE style derby — not the sport it is today. Why did you choose to do derby as a story? Covering professional sports can be draining because of the overwhelming negativity. Seeing my first derby bout was a rekindling of what I love so much about sports in the first place, away from the big-money and extreme fame. A group of people who are in love with a game, and get to share that love with like-minded people. It’s not about having the perfect physique, or the ideal height — it’s about wanting to compete, and willing to sacrifice yourself for it. That’s why it’s so compelling to me. What surprised you most about the sport? There was something pure about derby that I haven’t seen in other sports. Perhaps it’s a byproduct of being in a smaller town, but it’s rare to see people play so hard against each other with no jealousy or resentment. The final whistle sounds and it’s all over. The competitors who were trying to obliterate each other are taped up with an ice pack, and having a drink later that night. The mutual support was refreshing, and rare. How long did it take to report it and how did you go about it? Roughly five months from first bout to final product. I attended four bouts, roughly 10-15 practices, as well as one team meeting and a conducted a score of interviews — most of which were left out of the piece when I chose to narrow the focus to Susie “Miller Lightnin” Williams. How did you approach your reporting of this? Ultimately I think it was pretty simple: The exact same way I approach covering any sport. Typically my work involves NFL coverage, so I took the skills I use to diagnose a practice, or see where a play went wrong and applied that to a new medium. Changing my approach would have done derby a disservice. Why did you choose to report it this way? It was hard because there were enough compelling storylines that I could have gone 20 different directions. The interpersonal relationships between skaters, husband/wife teams who both are a part of GSORD, referees who give up hours of time for their role in the sport. The common thread every skater wanted was simply the opportunity to be taken seriously. 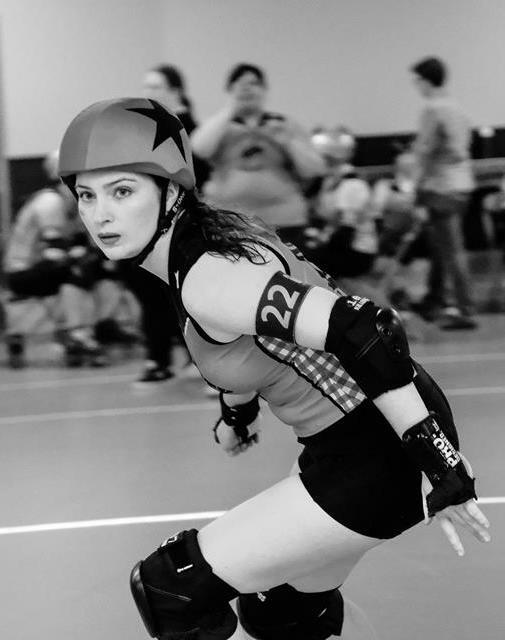 To that end Susie Williams was the epitome of someone who straddled the line between the fun/community aspect of derby, and the seriousness of wanting the sport to take the next step. She’d been with the league since the very beginning, and was one of the few skaters left who was there for each of the league’s milestones. How did being a newer, less traditional form of media change the way you covered derby? As a writer it’s about having the support of editors who are willing to move outside the mainstream, and who have the faith in telling a story that wouldn’t fall inside the traditional 24-hour news cycle. I think traditional sports media is stuck within traditional thinking, and doesn’t give an audience enough credit. Yes, people want to hear about the latest professional sports news — but there’s room for that coverage, and pushing the envelope with subject matter that speaks to the core reasons sport is loved in the first place. I certainly didn’t walk into the piece thinking “I’m going to fall in love with this sport,” but here we are. The notion is to serve the story, and to tell that to the best of my ability. I’ll be honest, it’s hard to spend so much time with these women and not inherit some of their passion for roller derby. That said, I think I had the luxury where accurately telling their story, and being a fan of derby weren’t mutually exclusive. Do you think you not being objective matters? Do you think it allows you to tell a truer story? The story could have had a very different ending if WFTDA didn’t approve their membership, and Susie’s retirement came well after the piece was written. If this was a different piece, then yes — I think objectivity would be important. However, I feel it would have been disingenuous to try and depict something as important as the legitimacy of female contact sports through derby without believing in it too; I think readers would have seen right through that. Why do you think so many other publications often fall into that cliche “By day Heather Steeves is a journalist for an upstanding newspaper, but by night she straps on eight wheels and is a rough and tumble roller girl …” sort of story? I think it’s because they don’t properly respect roller derby as a sport. The ‘by day, by night’ conceit is set up if the punchline is “ISN’T THIS ZANY? !” I find those piece immensely condescending. If someone works a day job, and plays rec-league soccer afterwards it’s not quirky, so why should derby because of skates and nicknames and the culture behind it? How and why did you pick the WFTDA recognition as the engine of your story? It was serendipity really. I think the best stories happen organically like that. Derby itself is interesting, but to arrive right as Greenboro was getting ready to take the step from WFTDA apprentice league to fully-fledged member was too perfect not to be the underlying story behind the league’s growth. Were there parts you left out that you didn’t want to? What were they? It’s less that there are parts I wanted in, and more that there are five more stories waiting to be told — they just didn’t fit in this piece. How is the story being received? The reception has been very good, and what’s most satisfying is seeing leagues all over the country telling their followers that my story was accurate, or did the sport justice. In the end that’s all I wanted, to tell a story I found compelling as accurately as I could. This wasn’t something that needed to be embellished, because the sport is interesting enough itself. Why did you let James have the access he did? When James contacted us, he let us know he wanted to tell the story of the sport of roller derby, not the novelty or the shtick as is so common with a lot of the coverage we get. He’d gone to a bout of ours previously and told me he was immediately hooked. We read his other pieces and were familiar with the site and knew the kind of stories they run, knew they take sport seriously, and were confident they could do the sport we all love so much justice. I saw you guys had coverage by your local TV station, which did the cliche derby story — did you know this would be different? We hoped it would be but there’s always that lingering apprehension. We’ve been on the morning news four or five times and while beyond grateful for the exposure and despite the fact that most reporters really have made the effort to research the league and ask about game play, a lot of it has been “lawyer by day, roller girl by night” coverage that is so common. I think going into any kind of potential news coverage, you always hope this is going to be the one that covers it like an actual sport. We knew James was a legitimate and talented sports writer which we felt would immediately give the article more weight than being just a story in the lifestyle section. Did James treat you differently than other reporters you’ve dealt with? He treated us like athletes instead of oddities which we’re thankful for more than he can possibly know. He took a very different approach to telling derby’s story — what did your league think of the final article? It was better than we could have imagined. It feels like an article about any other sport. This may seem a silly thing to be so excited about but anyone who’s involved in roller derby knows it’s kind of a big deal. He captured all the passion, the triumph, the heartbreak, the hard work and the time that goes into being a part of a roller derby league. The picture he paints really is honestly and truly Greensboro Roller Derby and we feel like he’s done a great service to our league and to our sport. Anything you wish wasn’t in there? Anything you wish he’d added? There are always some nerves involved when waiting for a finished piece of media on your league because you never know how it’ll turn out. This was a big deal for us so the stakes were a little higher. Without sounding like we’re sucking up, we really feel like it’s perfect. Do you think that using your WFTDA approval process was newsworthy? I do. Besides lending a narrative to the piece, the fact that roller derby has a governing body makes it more able to be related to other sports. Being able to say “we’re getting/we got accepted into the NHL or NFL of roller derby” I think will make people realize roller derby is a permanent, legitimate sport. Do you think the story reflected on derby as a whole? All leagues are different and have their own paths but we all have the same struggles and issues and victories, no matter how big or small. Telling our specific story is obviously going to be different from other leagues’ but I think there are parallels that tie us all together. He highlighted not only the athleticism but also the community and the importance of charity work. The fact that James takes the sport and its players so seriously reflects well on roller derby and I hope others agree. Anything else you want the derby world to know? We know we were ambassadors for the entire sport in the article and hope we did roller derby proud.